Arbeidsledighet i Storbritannia. Det er alt. ONE of the few bright spots in the general gloom around the British economy has been the jobs figures. Today’s data seem like more of the same, at least at first glance. 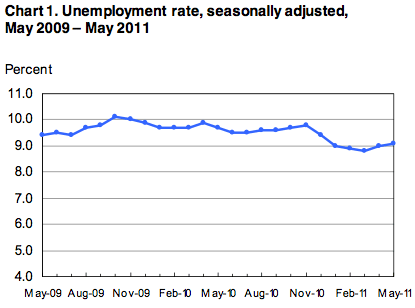 Unemployment fell by 88,000 in the three months to April, the biggest quarterly drop for more than a decade. The jobless rate slipped to 7.7%, which seems almost tolerable given the rates in other debt-ridden, housing-bust economies such as Spain (20.7%), Ireland (14.7%) and America (9.1%). And enough private-sector jobs (105,000) were created in the first quarter to more than make up for government layoffs (24,000). That pay growth is so hopelessly feeble, at just 1.8%, is almost a plus. Any sign of a wage response to high consumer-price inflation (currently 4.5%) might spook the Bank of England into raising interest rates. But a closer look at the jobs data reveals signs of further slowdown in an already sluggish economy. The fall in unemployment was heavily concentrated in the 18-24 age range, which would be great news if it were matched by job gains. But only 12,000 of the 79,000 youngsters who «left» unemployment in the three months to April found work; the rest simply dropped out of the workforce—into full-time education or idleness. The claimant-count measure of unemployment also suggests the jobs market has hit a soft spot. It rose by almost 20,000 in May alone, the biggest increase for almost two years, after a 17,000 rise in April. There is less focus these days on this gauge because it captures only those who are eligible for jobless benefits, a small subset of those who are without work. Yet it is more often a better guide to the trend in the jobs market than the more volatile headline measure of unemployment, based on a household survey. Tighter restrictions on welfare support for single parents since the end of 2008 have pushed more people onto the dole, swelling the number of claimants. But that change affects more women than men—and it was men who accounted for most of the rise in unemployment in May. The economy, it seems, is rather wobblier than the headline jobs figures suggest. Rekordprofitt på Wall Street og sta arbeidsledighet på 9%? Hva skjer? I dag kom rapporten som viste at USA skapte ca. 50 000 nye arbeidsplasser i privat sektor. Uheldigvis må det ca. 150 000 plasser til for å holde følge med befolkningsveksten. Derfor ble det flere ledige i mai måned. Samtidig har private bedrifter på Wall Street kunngjort enorme profitter, topp 5 i historien faktisk. Så hvorfor omgjøres ikke denne profitten til jobber? The vibe on Wall Street couldn’t be more at odds with deflated Main Street. Yes, stock prices headed down after today’s disappointing jobs report, which showed unemployment rising to 9.1%. But for anyone who hasn’t noticed, big corporations are still making a killing. What gives? 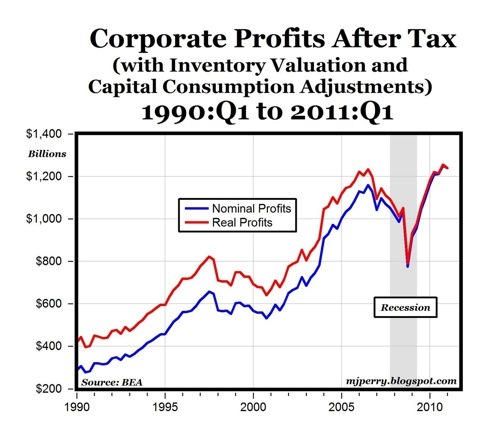 So, what’s so great about corporate profits if they don’t translate into American jobs? The truth is, not that much. A lot of companies say they’re waiting for the global economy’s big uncertainties to clear up before hiring: Japan, the Middle East, the eurozone crisis. And of course there are a lot of questions about how things will shake out in the U.S., which have left companies clinging to cash: healthcare reform, financial regulation, a possible double-dip recession, taxes and the budget debacle. Companies have little incentive to invest in technologies that save on labor or otherwise increase the competitiveness of the labor-intensive value-added activities in advanced economies. In short, companies’ private interest (profit) and the public’s interest (employment) do not align perfectly. These conditions might not last: if growth continues to be high in emerging economies, in two or three decades there will be less cheap labor available there. But two or three decades is a long time. In the meantime, even though public and private interests are not perfectly aligned today, they are not perfectly opposed either. Relatively modest shifts at the margin could bring them back in sync. Given the enormous size of the global labor force, the dial would not need to be moved very much to restore employment growth in the tradable sector of the U.S. economy. In the globalized labor market, companies are now using their profits to invest sparingly in high-skilled jobs in the U.S., which offers a better return on their investment, while sourcing more lower-skilled labor from abroad. Those investments still contribute to U.S. growth, but they don’t do much for U.S. jobs. “A lot of revenue growth is outside the United States. If I’m building new stores in China, I’m staffing them in China. That feeds back to some employment gains in the U.S., but it isn’t big,” says Dartmouth economist Matthew Slaughter. The bottom line is that the good old profit motive can no longer be relied upon to secure more jobs for the average American. That may sound pretty hopeless, but there are solutions. Spence says more collaboration between government, business, and labor can help, which would 1) push corporations to invest in technology advancements they wouldn’t normally make, which would in turn increase the productivity of lower-skilled U.S. labor, and 2) push U.S. workers to accept more globally competitive wages, aka less money. A good example is Germany, which, unlike the U.S., still has a booming manufacturing sector despite being a wealthy, developed country. The reason? Long before the financial crisis and recession began, Germany’s business sector and labor unions got together to make mutually-beneficially sacrifices for what they considered good of the country. Employees agreed to slower wage growth, and corporations agreed to be less erratic with hiring and firing. The agreement led to pretty paltry wage rises over the years for the average German, but Germany’s income inequality is low and its unemployment rate is only 6.3%. By contrast, U.S. unemployment is still sky high, but wages on average have risen faster than most other advanced economies. But the problem is this: There are still a few sectors of the U.S. economy that are benefiting from the new global game…finance, computer engineering and design, and not surprisingly, the top management at big corporations. So what would motivate corporate America’s big bosses to trade away their soaring incomes for the sake of the average Joe? Obama should consider calling Germany to figure that one out. Otherwise, the invisible hand will continue on its merry way. Ser man det, ned 1% poeng. Alt ned bortsett fra mat og drikke. Årets lønnsoppgjør er unnagjort (for det meste) og disse SSB tallene er fra februar og mars, hvor utfallet av forhandlingene fortsatt var noe usikkert. Også, hvor mye (eller lite) har fremtidig rentenivå å si for disse tallene og spesielt for april/mai tallene? David Romer spør: Hvorfor er vi (USA) likgyldig til 9% arbeidsledighet? An Important Starting Point—with One Gap: I had one major source of unhappiness with last week’s conference: the participants were largely silent about the dismal outlook in the advanced economies for the next several years. The current outlook for unemployment in the United States, Europe, and Japan is probably worse than it was in late 2008. Then, mainstream forecasts for 2009–2011 showed unemployment rising sharply—but generally to levels below what we are experiencing today—and then returning toward normal at a moderate pace. Today, not only is unemployment higher than most 2008 forecasts of its peak levels, but the expected pace of recovery is weaker. Despite this deterioration, the dire sense of urgency in late 2008 has not increased. Indeed, it has largely disappeared. I find this complacency in the fact of vast, preventable suffering and waste hard to understand. With the exception of that one critical omission, I was impressed by the discussion. One striking feature was the consensus that there is no consensus. That is, no one argued that there was widespread agreement about a simple set of rules for achieving macroeconomic stability, robust growth, and shared prosperity. Indeed, no one proposed such a set of rules. The crisis has, appropriately, made macroeconomists and policymakers humble about what we know. Although we must continue to give the best policy advice we can, this is also a time for intensive thought and research. I found the conference to be a valuable contribution to that process. And I thought that the fact that it was the IMF that organized the conference—and, especially, the wide range of perspectives of the people it invited to participate—reflects very well on the institution. It is a sign that the Fund understands that it does not have all the answers, and that it needs to look broadly in its efforts to rethink issues that were widely viewed as settled just a few years ago. Because of asymmetric information, agency problems, and behavioral forces, financial markets do not reliably produce efficient outcomes. Moreover, even well conceived and well implemented microeconomic regulation cannot ensure that financial market imperfections will not lead to adverse macroeconomic outcomes. Thus there is a need for ‘macro-prudential regulation’—that is, regulation and supervision that address financial risks to the macroeconomy. The idea of ‘the’ fiscal multiplier is not sensible. The impact of a change in fiscal policy is extremely dependent on whether monetary policy is able to respond, and on how it responds if it can. The impact also depends on the state of the economy, the health of the financial system, the time horizon of the change, its specific form, and more. Capital controls should be part of the macroeconomic toolkit. Even speakers who were skeptical of capital controls thought there were circumstances under which they were a reasonable short-term expedient. 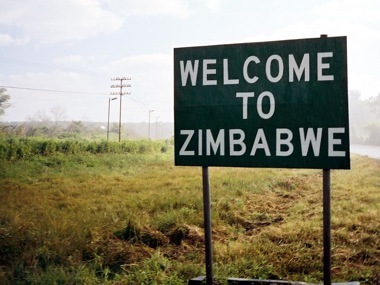 And others felt they were a fully appropriate response to the prospect of large inflows of short-term capital that could lead to substantial overvaluation of the exchange rate. The simple ‘one instrument/one target’ view of monetary policy (where the instrument is a short-term interest rate and the target is inflation, or a weighted average of inflation and the output gap) is too simple. There are other instruments (exchange market intervention, capital controls, margin requirements, down payment requirements, capital requirements, and more), and other potential targets (notably the exchange rate and indicators of financial risks). Having a domestic central bank—specifically, the U.S. Federal Reserve—be the main provider of emergency liquidity to central banks around the world, as occurred in 2008 through swap lines, does not seem optimal. Finding an arrangement where an international body plays that role would be desirable. Du gamla, Du fria, Du fjällhöga arbeidsløse. Du har sikkert snakket om det med venner og bekjente. Kommentert på det når du opplever det. I møter, på venteværelser, på bussen, på cafè og på lesesalen. Hva kan det være? Det er da 148 000 arbeidsledige svensker i aldersgruppen 15-24, men det som er bittert for våre unge svenske venner er det neste tallet. 24,6% av den aldersgruppen står utenfor arbeidsmarkedet, men vil gjerne inn. Det er ned 5,4% enheter fra samme periode i fjor, men det er ikke nok for å imponere denne bloggen. Med en vekst i den svenske økonomien på over 7% ifjor, er det permitterte og ansenitet som får jobb, ikke unge (relativt). Derfor kommer de til oss, hvor vi har en total arbeidsledighet på 3,4%. Arbeidsledighet i utvalgte land. Bare så du er oppdatert.